Make game night fun for family members of all ages with this Mini Pool Table by Hey! Play! This tabletop set comes with triangle rack, table brush, pool stick chalk, two pool cues, and pool balls. The compact size of the table makes it portable and easy to store. 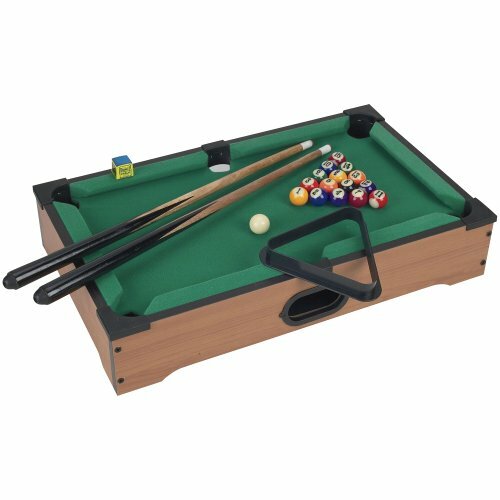 SMALL AND PORTABLE- This portable miniature pool table set is the ideal space saving size and is perfect for places where you don’t have room for a full-sized billiards table, like the kid’s playroom or the family room floor. REALISTIC DESIGN – This mini pool table is made with wood and the same green felt that covers regulation sized billiards tables. Game balls and cues are the optimal size and weight for the table, making it easy to practice shots and perfect your skills. FUN FOR ALL AGES- This tabletop billiards game is great for all ages. Small enough for children to maneuver easily, yet sturdy enough for adults to enjoy as well. Everyone can appreciate this toy on family game night. PRODUCT DETAILS- Dimensions: 12.25″ (W) x 20.25″ (L) x 3.5″ (H). Comes with: Triangle rack, table brush, pool stick chalk, two 18.75″ pool cues and Sixteen 1″ diameter pool balls. SATISFACTION GUARANTEED- Hey! Play! is committed to providing consumers with the absolute best price and value on our products. NOTE: This is an exclusive product of Hey! Play! and ONLY Mini Pool Set is GUARANTEED to be genuine.